Great picture! Saturn and its moons are simply fascinating. You can clearly see the E ring (the outermost one), which is believed to be constituted primarily of particles coming from the constant eruptions on Enceladus. As an added bonus, the little dot that's visible on the left just inside the G ring is the Earth! Wow. But if it's spitting out water, wouldn't it eventually run out? 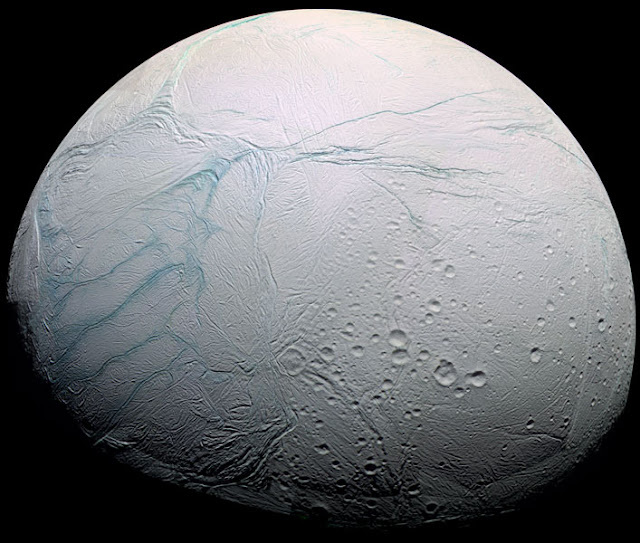 Or does the gravity of Enceladus pull it back in? ??? That's an interesting question. I can't give a definitive answer to it, but my guess is most likely yes, it will eventually run out. "Terry A. Hurford: Most of the material does fall back under the surface of Enceladus, but about 10% of it escapes [...]. One of the thoughts about the south polar region is that it is depressed a little bit from the rest of the moon. So, maybe that might be an indication of how much material has actually been lost from that part of the moon." A tad late of a comment. I was wondering what was going on with Venus, which seemed brighter than ever as it zoomed past pleiades. I was curious about its motion relative to the earth, and looked for a solar system simulation on the web. I learned Venus is getting closer to Earth in its orbit on a crude simulator, and then found this preview of a coming simulator on Reddit. Looks amazing. The comments mention several other competitors which I haven't checked out yet.